Clicking on the link opens it in a new window. Mission Hill and Clone High Refuge - fansite where the owner plans to make Flash cartoons of both Mission Hill and Clone High. Teletoon - the network that carried Mission Hill in Canada. Currently does not air it. Cartoon Network - the network that carries Mission Hill in the U.S. Adult Swim - the programming block of the Cartoon Network that airs Mission Hill. TV Tome - the Mission Hill page for TV Tome, an extensive TV information source. TV Dad Interviews - this site, focusing on TV dads, has interviews with Wallace Langham (the voice of Andy French) and Bill Oakley and Josh Weinstein ( the producers / creators of Mission Hill, as well as former producers on the Simpsons). In both interviews the main topic is Mission Hill and how Andy is seen as sort of the single father figure. CAKE - the official website for the band 'Cake', who did the Mission Hill theme. The Unofficial Adult Swim Website - there's a section about Mission Hill here. 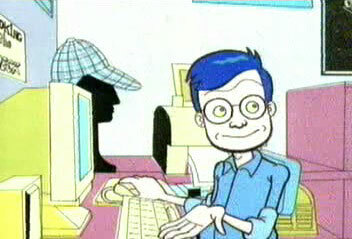 TeeVee Archive - Fall '99 Mission Hill - An article about Mission Hill's abrupt cancellation. Which Mission Hill roommate are you - Take the quiz and find out which Mission Hill roommate are you! Morphizm.com - an interview with Bill Oakley and Josh Weinstein as they talk about the creation of Mission Hill and their plans for the future that never came to be. TVtome.com - An episode guide and general information site about Mission Hill. Brian Posehn - The official site for comedian Brian Posehn, the voice of Jim; with bio, rants and a message board. Lisa Kushell.com - The official site for the comedian Lisa Kushell, voice of Mrs. Peck and other characters. Mxtabs - Cake - Italian Leather Sofa - Guitar tabs for the theme song of Mission Hill. Cinescape - a cool site to find out about what's happening in movies, TV, and other media. Comics Continuum - the greatest comic book news site out there. Can't get enough Futurama - The best Futurama website in existence!